As an artist, Hendrik Jan Wolter was inspired by the sea, water and travelling. 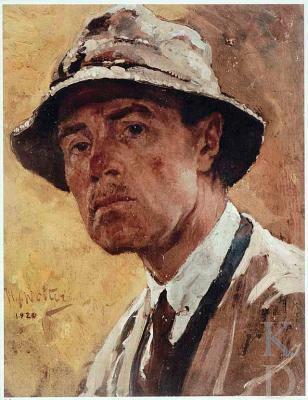 He often visited France, England and Italy, painting beautiful seascapes and harbour scenes. This painting shows a view on the interior harbour of Camogli, a small Italian fishing village in the province of Genoa on the Italian Riviera. Recognizable features of the harbour are the arched bridge and the typical Ligurian houses. As peaceful as the scene looks in the painting, as crowded is the area today. A harbour filled with boats, cars parked on the bridge and terraces where tourists are enjoying the surroundings. Wolter painted the scene in a loose manner. With swift brushstrokes he rendered the reflections of the coloured houses in the water. 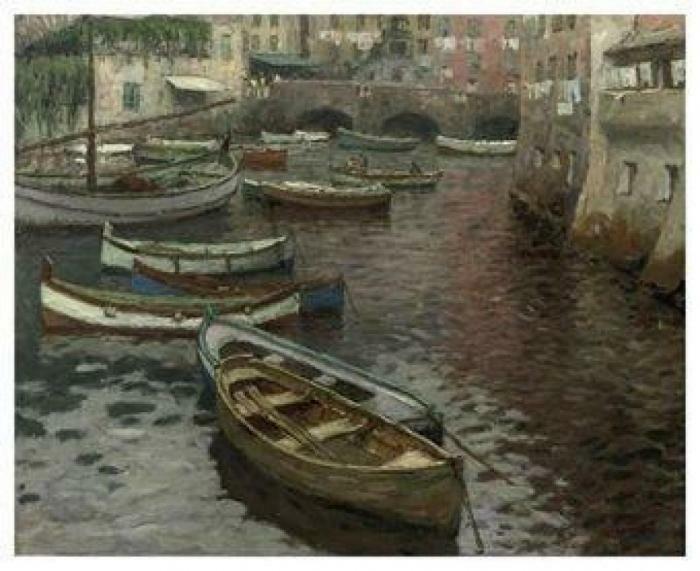 In this Italian harbour he beautifully places dark tones next to lighter grey, creating contrast and a sense of lightly heaving boats. He was always fascinated by depicting scenes with water; bright light reflecting, a breaking wave against a rocky coast or, in this case, rippled water in a quiet harbour. Hendrik Jan Wolter was born in 1873 in Amsterdam and moved to Amersfoort with his family at the age of 12. In 1895 he moved to Antwerp, where he enrolled at the Academy of Fine Arts. Here he was introduced to the work of the French Impressionists and he saw the work of Pointillists like Seurat and Signac for the first time. This period deeply influenced the development of Wolter’s style . . .